While Gronk made all the plays, Rob Gronkowski knows its time to step away, Travis Lazarczyk writes. With 7:41 left to play in the 2010 season opener against the Cincinnati Bengals, Rob Gronkowski caught the first touchdown of his NFL career. It was a one-yard pass from Tom Brady. There would be 78 more touchdowns in the regular season, and 12 more in the playoffs. On November 14, 2010, Gronk caught three touchdown passes in a Sunday night 39-26 win in Pittsburgh. 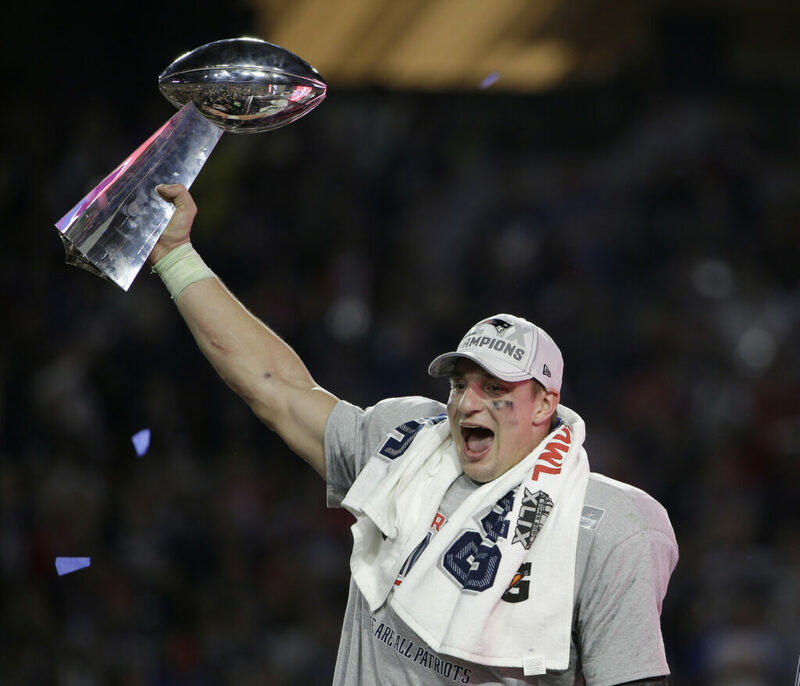 In prime time, in front of a national audience, Gronk introduced himself to the casual NFL fan. On January 22, 2012, Rob Gronkowski suffered a severely sprained ankle in the AFC championship game against the Baltimore Ravens. He tried to play through the injury two weeks later in the Super Bowl. Against the New York Giants, he limped his way through the game, mostly as a decoy. Gronkowski caught two passes for 26 yards. On November 18, 2012, Gronk caught seven passes for 137 yards and two touchdowns in a 59-24 win over the Indianapolis Colts. It was one of the many times Gronk was uncoverable. On that same day, Gronk broke his arm. He missed the rest of the regular season, and returned for a playoff game against the Houstin Texans. The arm, not completely healed, broke again. On December 1, 2013, Gronk caught six passes for 127 yards and a touchdown in a 34-31 win over the Texans. The touchdown came late in the first quarter, with Houston holding a 10-0 lead and momentum. It was a 23-yard pass from Brady, the kind he and Gronk connected on so many times. One week later, on Dec. 8, Rob Gronkowski’s season ended against the Cleveland Browns when he was hit in the knee by a helmet. His season started late, as Gronkowski recovered from the broken arm and back injuries. Now, with the ligaments in his knee torn to confetti, it was over. On November 16, 2014, again on Sunday Night Football in front of a national audience against the Colts, Gronk played the sequence that may define his career. Two plays should be in any compilation of Gronk’s Greatest Hits. Less than two minutes of game time later, Gronk caught a pass near the left sideline, five yards from the line of scrimmage. His momentum was carrying him towards the sideline, but Gronk stopped, cut, and spun away from the first Colts defender. As he ran towards the middle of the field, Gronk stiff-armed two more Colts to find open space. As two Colts converged to meet Gronk near the goal line, he simply leaped through them, into the end zone. He was in mid Gronk spike as he regained his feet. In the middle of the 2016 season, Gronk had a stretch in which he gained at least 93 yards in four straight games, with at least 109 yards in three of them. Gronk caught three touchdowns in that run, and averaged 22.5 yards per catch. In early December, 2016, Rob Gronkowski went on season-ending injured reserve after back surgery to repair a herniated disc. The back surgery came a few weeks after Gronkowski suffered a lung injury when he was pulverized by Seattle Seahawks safety Earl Thomas. In 2017, Gronk returned and had one of his best season, catching 69 passes for 1,084 yards and eight touchdowns. It was Gronk’s fourth season with 1,000 yards receiving. In the Super Bowl loss to the Philadelphia Eagles, Gronk caught a team-high nine passes for 116 yards and a pair of touchdowns. 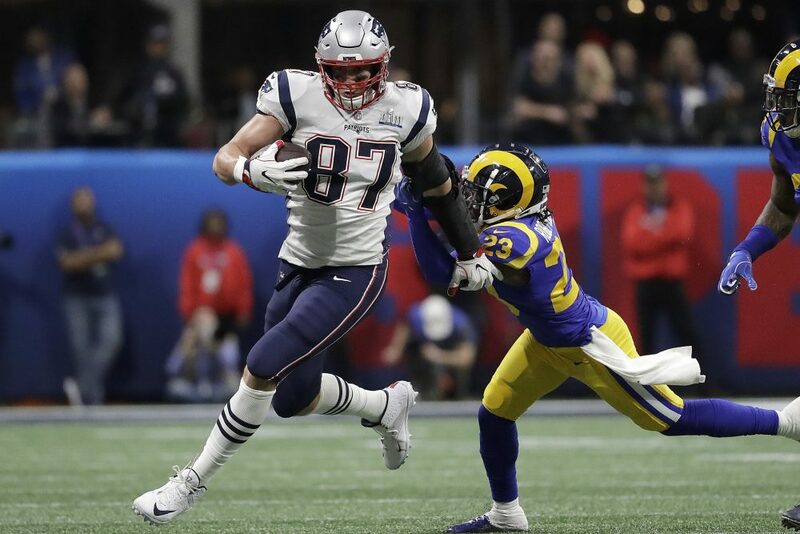 On Feb. 3, almost two months ago, Gronk caught six passes for 87 yards in New England’s 13-3 win over the Los Angeles Rams in Super Bowl LIII. The longest went for 29 yards. It was also the last. Gronk caught the ball, surrounded by defenders, as usual. He stretched out, diving to make the catch. Gronk had a defender on his back, as usual. He made the catch, as usual. The play set the Patriots up at the Rams two yard line, and Sony Michel scored the game’s only touchdown on the next play. On March 24, Rob Gronkowski took inventory of all his surgical scars, multiple concussions, the daily pain that comes with playing football at the highest level. He looked at that, and thought of his future, and said enough.